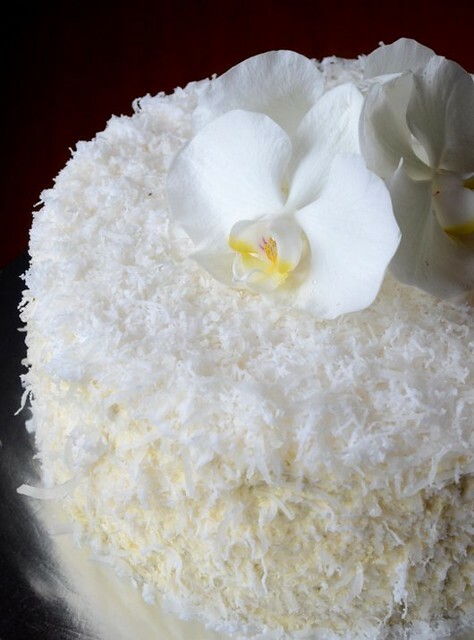 Dreamy, pretty, romantic-looking Southern Coconut Cake was moist and delicious. For years I've wanted to make the Southern Coconut Cake and last weekend I had a good reason to make one because it was a friend's wedding anniversary. I have tested several coconut cake recipes including those from Saveur but they weren't what I was looking for, especially those made with the traditional 7-minute frosting. I so believe in Rose Levy Beranbaum's recipes that I not only made a whole recipe of her coconut cake, I even made her Silky Meringue butter cream which is so laborious that only someone as dogged as me will put herself through it, a buttercream made up of three recipes: a creme anglaise, an Italian meringue cream and the blending of both creams with butter. Was the effort worth it? You bet, because the frosting lived up to its name and was the silkiest, lightest buttercream I've ever eaten. The cake was a huge hit at the party. It's the best coconut cake I've tasted so far and again, I wonder why, with coconuts being a tropical fruit, coconut cakes are non-existent here. Making the cake batter was unusual, something I've never done before, but the resulting cake was beautiful in texture. 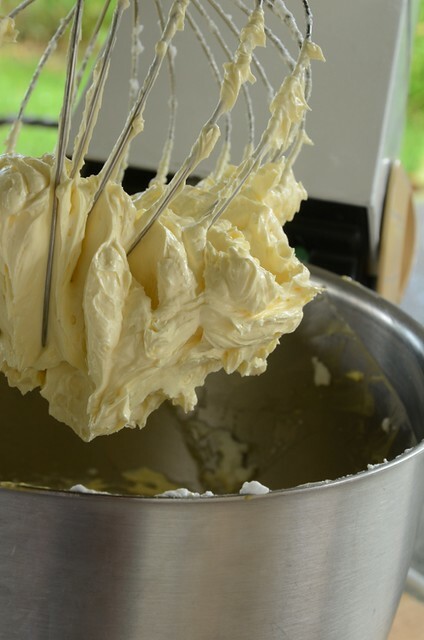 Butter, sugar, salt and flour are whisked together first and then the butter is whisked in, followed by the unwhipped egg whites and coconut milk mixture. 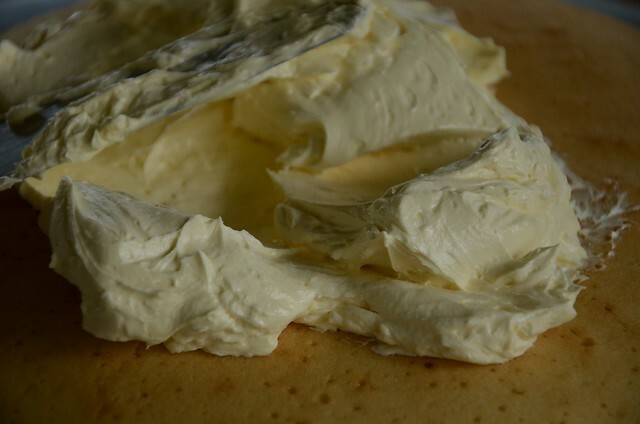 Only egg whites are used in the cake batter, which is why the cake is very light yellow. The yolks are used to make the creme anglaise. As usual, I reduced the amount of sugar by nearly half. Sugar adds moisture to cakes and taking away too much of it will affect the taste and texture of the cake but I can sacrifice a bit of moistness in the cake for my kidneys and arteries. I also reduced the salt by more than half and it didn't do harm to the taste of the cake because I think the reduced saltiness was balanced by the reduced sweetness. I think that it's quite redundant to add a lot of sugar to balance a lot of salt in a cake. Cakes really are quite unhealthy and this coconut cake is not an exception although the buttercream is made a lesser evil by reducing the butter and bulking up with meringue. I've given the recipe for the cake, adapted for my taste, but I think other than copyright considerations for the Silk Meringue, the 3-page recipe is just too much for me to type. You'll have to get Rose Levy Beranbaum's heavenly cake cookbook, Heavenly Cakes, for that or Google for it. A friend described the cake texture as "between a sponge cake and a buttercake". If you are tired of airy spongecakes, you'll love this cake. 1. Oven preheated at 175 C. Prepare two 9 by 2 " round pans by lining with baking paper, then greasing them and lightly flour them. 2. Use a hand whisk to whisk the egg whites, 1/3 cup of the coconut milk, vanilla and coconut extract until just combined. 3. In the bowl of a standmixer, mix the flour, sugar, baking powder and salt at low speed for a couple of seconds. 4. Add the butter and remaining coconut milk. Mix on low speed until the dry ingredients are moistened, then increase speed top medium and beat 1 1/2 minutes. Scrape down sides of bowl. 5. With the mixer at medium speed, gradually add the egg white mixture in 3 parts, beating at medium speed for 20 seconds after each addition. 6. 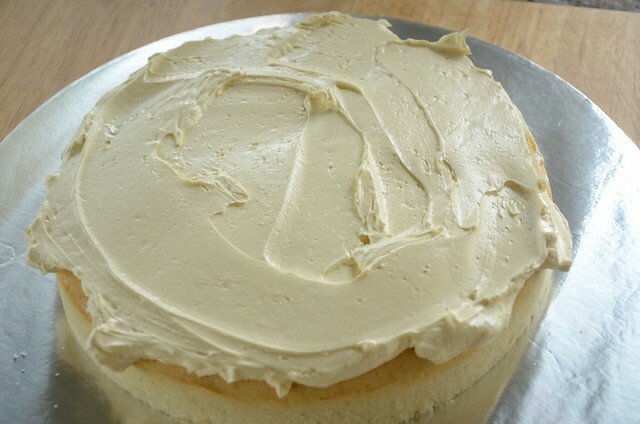 Divide the batter evenly between the two pans and bake 30 to 40 minutes or until a wire tester inserted in the center of the cake comes out clean or the cake springs back when pressed lightly in the center. 7. Cool the cakes and ice with your favorite meringue buttercream to which about 2 cups of fresh grated coconut is added (I preferred not to). 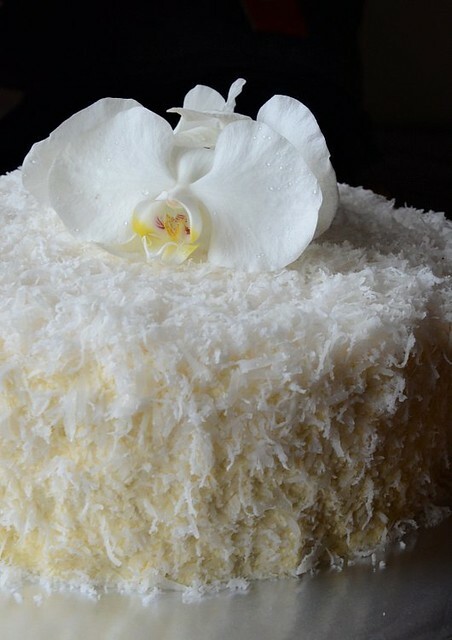 Use a mixture of dessicated sweetened coconut flakes and freshly grated coconut to cover the whole cake. Chill if not serving immediately and take out from fridge 1 hour before serving. Love this cake. It's light. Perhaps it tastes better with cream cheese? ivy: a true baker! there are southern coconut cakes with cheese frosting:) didn't you like the meringue cream? i think i shd've put more of the buttercream in between the cakes. Beautiful cake ! I have this book but yet to try any recipes, maybe I should start with this cake. Meringue cream is fine but i think cream cheese would be better. Will still give this cake a thumb up. wow you've made the cake beautifully, and you got me hooked - definitely trying out the silk meringue soon! Heh! heh! heh!.. I was looking for a good coconut cake to make.. I shall try this then. Hehehe.. I dont think I will do the buttercream as I personally dont like buttercream. I will try it with cream cheese. but will flavor it with lime. Terri, this looks absolutely incredible! How I wish I could eat it! Terri, this cake looks marvelous! Very pretty and elegant cake. I feel like making one myself now. I can imaging the taste ^^, but I probably only have time to make this for rhe new year's eve celebration after my Malaysia trip. Thanks for sharing. 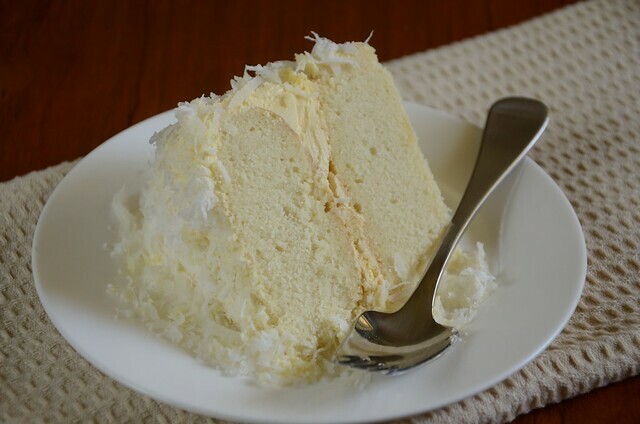 But I must try her coconut cake too..it looks sooo good.And beautiful. Sonia: there r so many gorgeous cakes in the book! Try smoothing diff n blog about it! Ivy: but cream cheese will compete with the coconut flavor? Janine: u can make more n keep in the freezer. Really yum. But I think if u make more for freezing, don,t add the coconut essence so tt you can use other flavoring as you like. Food: no! 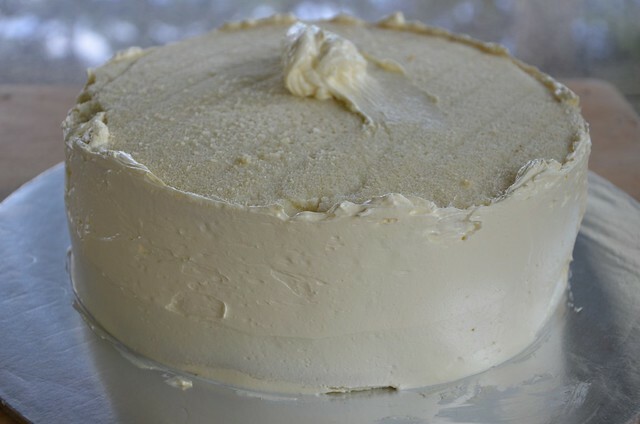 This buttercream has the texture of mascarpone cheese, silky n light! Malaymui: when will you be here? Zurin: make it make it! 13-18th dec, just by myself, will you be around? Malaymui: Going to KL 10 to 14 dec, my niece,s wedding on 15 dec so am free after tt. Pls call me, u still hv my no?